When we went to Perugia last week I was quite excited. I had only been once (in 1992) since my time there studying at the Università per Stranieri di Perugia for three months in 1986. 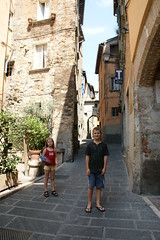 Perugia was my first stay away from home. Perugia was the first time I interrailed alone across Europe (there was no wimpy Ryanair for the students in my day - we only had the means to ship ourselves surface-mail!) So Perugia was where I grew up in the space of three months. I learned very quickly (the hard way) how to be a lone 18 year old foreign female. When I first arrived in Perugia, for example, I knew I needed a residence permit - this was way before the borderless 1990s. I heard the place to obtain one of those was the police station. I popped into the local Caribinieri and asked for one. The officer behind the desk, probably 30 something, asked me my name, address, phone number etc and filled out the forms. He then asked what I was doing Friday evening. I wondered if, with my fairly intermediate Italian, I was misunderstanding. He then went on to thank me for my private details, told me he'd look me up and pointed out I ought to be at the Polizia and not the Caribinieri! I'd started to learn. A week later I broke out in a rash. A friend back home had rung me the night of my departure to say she'd come down with chicken pox. The timing wasn't great given we'd had lunch the day before. I thought I ought to have it checked out. I went to the farmacia, they weren't sure and sent me to the cottage hospital nearby. I went in and asked two doctors in white coats. They made me strip, checked me over inch by inch and then declared that they too weren't sure but given they were porters they'd call me a doctor. I'd learned a little more! After that I think I got the hang of Italy. One thing I really loved in Perugia was my flat. I shared a beautiful attic flat in Via della Viola with two Austrian boys of about 20. It was an ancient stone building in a narrow street as you can see from the photo above. I used to love to look out on the red roof tiles of the neighbours. I can still smell the old wooden staircase. Unfortunately after just two or three weeks the roof began to leak in a storm and my landlord moved me to a boring modern flat two or three streets away with a lovely balcony, fig tree and several weird Korean inmates. I lived two or three weeks in my beloved Via della Viola and another ten in my boring modern flat. So Viola was my true home, my first love: the first flat of my own, the epitome of ancient Italy. I lived at number 88. I dragged Thomas, Marcel and Lots round the back streets of Perugia in the searing heat for half an hour before finding it. I skipped happily along the road as far as number 56, but the road stopped there! Huh?! I was 100% sure I lived at number 88 but there was no number 88. This is bizarre. I thought through later flats - one in Germany, four in France - I still know all those addresses by heart though they date from the same era. I even remember the boring modern flat in Perugia's address so how can I have got the Viola number wrong? I am now contemplating climbing up in the loft to retrieve an old suitcase where I kept the letters from my student days to get to bottom of the Viola address problem. Was it 8, or 18 or 8.8 or something? I doubt it, but how else can I explain it? Of course the other three have spent the week casting aspersions on my sanity or senility. WHEN DID SENSE DROP OFF THE RADAR? OH NO - CROCODILES UP THE WALLS!